Nottinghamshire and Derbyshire in the British Midlands make up one of the largest former coalfield areas in the UK. The consecutive closure of coal mines throughout the 1980’s and 90’s profoundly changed Britain’s industrial landscape forever and left an industry responsible for driving Britain’s industrial revolution a shadow of its former self. Coal communities were hit hard economically and socially, while the deregulation of financial markets caused an economic revolution in other parts of the country. 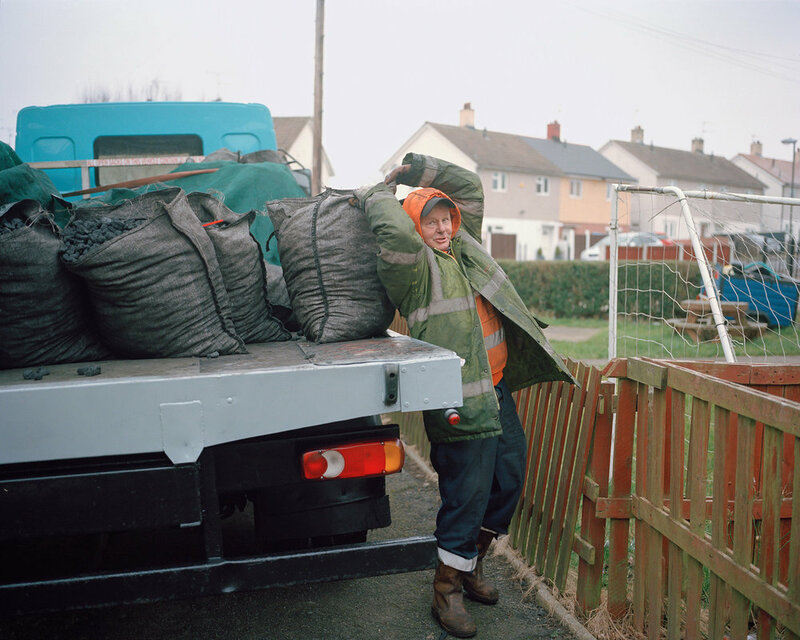 I began photographing the people and places of the Nottinghamshire and Derbyshire coalfields to capture culture and social life in the region three decades on from the bitter 1984-85 miners’ strike. When then prime minister Margaret Thatcher—Maggie, to the British public—closed the mines, workers protested her attempts to diminish the industry at large and deplete the union that represented it. The strike splintered the workforce, with disputes over its legality creating divisions that the government grasped on. After a yearlong struggle, the strike was lost, spelling the beginning of the end for British coal mining. In the years that followed, coal-mine closures became rampant, and unemployment in the coalfields skyrocketed. Thanks Maggie is a deeply personal project that speaks of my own roots and identity. My Father worked in the mines for decades until he was made redundant by the closures; my Grandfather was a deputy at Sutton, a local colliery during his time. The work draws on the artistry and musicality of the coalfields. Music and dance were a major component of mining culture, remnants of which still exist in the miners’ welfare clubs and colliery brass bands. Rock ‘n’ Roll culture was embraced by British working class communities in the 1950’s—today, the ex-mining generation has many Rock ‘n’ Roll fans and various tribute acts who perform in the Miner’s Welfare Clubs. Thanks Maggie includes work created for the First Art PORTRAIT commission. First Art is an arts partnership bringing together communities within the former coalfields of North Nottinghamshire and North-East Derbyshire via a three year programme of arts projects funded by Arts Council England’s Creative People and Places fund. Bingo at Boothys Working Men's Club, Mansfield, Nottinghamshire. Working Men's Clubs such as this began in the 19th Century in industrial areas of the UK to provide recreation for working class men and their families. Many clubs have closed following the decline of industry. 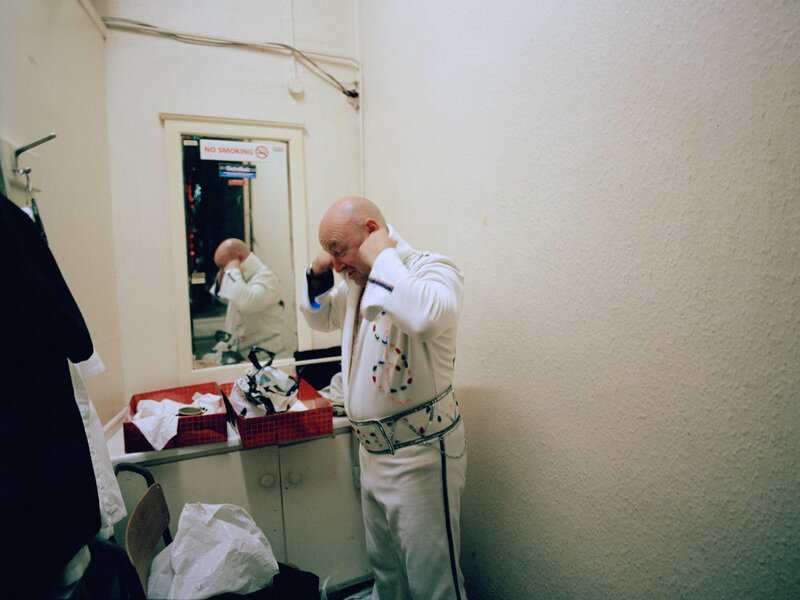 My Father preparing backstage to perform his Elvis tribute act, Boothys Working Men's Club, Mansfield, Nottinghamshire. Variety entertainment including stand-up comedy, live bands and drag acts form the basis of Working Men's Club culture. Condemned National Coal Board terraced housing in the village of Pleasley. These were homes provided for the mineworkers of Pleasley Colliery and their families. Derelict winding towers of the former Clipstone Colliery, Nottinghamshire. These structures are under threat of demolition but members of the community are fighting to save them as an enduring monument to the coal mining industry. Volunteers at the restored Pleasley Colliery, posing with the National Union of Mineworkers Clipstone Branch banner. Union banners such as this one were marched through the streets of colliery towns and villages during the 1984-85 strike, which is widely regarded to be the most bitter industrial dispute in British history. David Coleman, an ex-miner known locally as "The Pitman Poet". Coleman writes poetry about his and others experiences working down the coal mines. Pleasley Colliery Brass Band rehearsing at Pleasley Miners' Welfare, Derbyshire. Brass bands were started by colliery owners keen to encourage music and community within the mining villages. 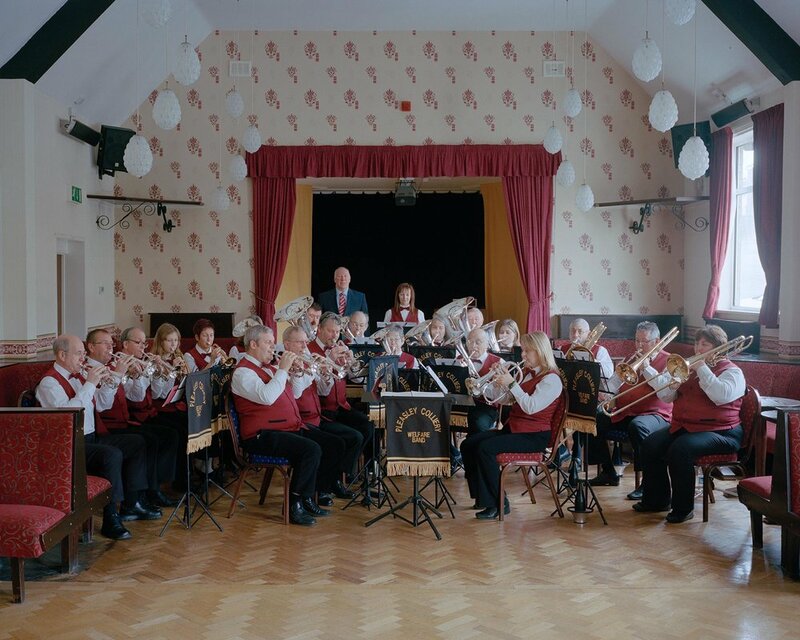 Many colliery bands, including Pleasley, have continued playing long after the colliery closures and are still a central part of community celebrations. 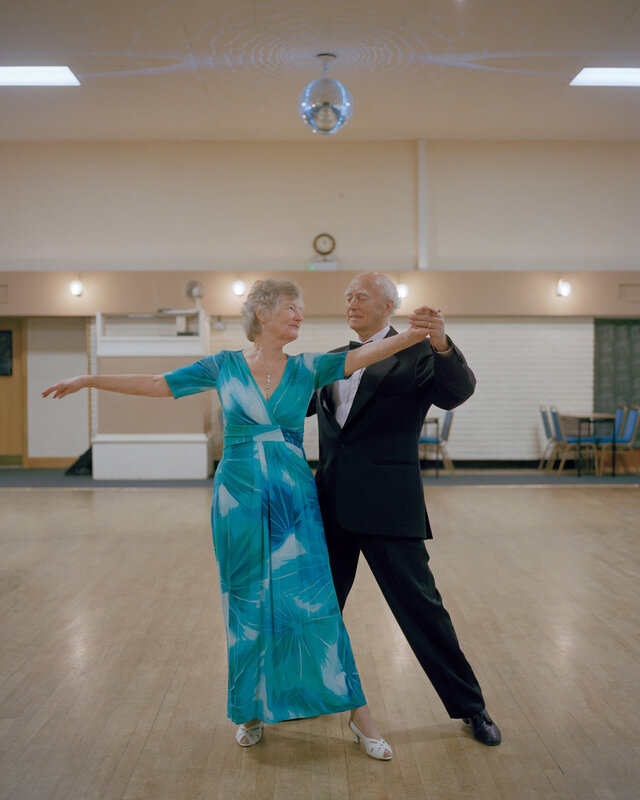 Bill, an ex-miner, with his partner Pauline attending their Ballroom Dancing class, Forest Town Miners' Welfare, Nottinghamshire. Throughout the 20th century, Ballroom Dancing became popular among the working class who attended public dance halls or "popular assemblies". Miss Mansfield 2013-2014, Forest Town Miners' Welfare, Nottinghamshire. When the local coal mines were open, it was tradition for each colliery to crown a "Coal Queen", who were mascots for the industry. Teenagers from the ex coal mining village of Newstead partcipating in a community programme designed to aid young people who have difficulty engaging within school. The project involves maintaining and regenerating the former colliery site. Djay delivering groceries, Langwith, Derbyshire. A young person from Langwith, Derbyshire, delivering groceries to elderly residents from the nearby farm where he has found work. Youth unemployment is particularly high in former coalfield areas. Briony, former Sherwood Colliery site, Mansfield Woodhouse, Nottinghamshire. The ex colliery sites are large open landscapes on the periphery of local towns and villages. Rabbiting, former Newstead Colliery site. Hunting for food and sport goes back many generations in the area. Pigeon racing was a favourite pastime among mineworkers. The soaring birds provided a sense of freedom after working in cramped conditions underground. Local skaters designed the plaza themselves and formed an action group to get it built. Michael at the skatepark, Mansfield, Nottinghamshire. Anna after skating, Sutton-in-Ashfield, Nottinghamshire. Nottinghamshire became synonymous with figure skating during the Miners' Strike due to the world renowned success of local skaters Jayne Torvil and Christopher Dean, at the 1984 Winter Olympics. Since the colliery closures, money has been spent on improving sports and leisure facilities to improve health and wellbeing in the area. Jo, a club singer, performing at Mansfield Woodhouse Ex-Servicemen's Club, Nottinghamshire. Social clubs and Working Men's Clubs were once thriving venues attended mostly by workers and their families. Today, a club entertainment scene still exists but the venues are in decline. Stephen, an ex-miner and Elvis Presley fanatic, at home with his 1950's jukebox. Rock 'n' Roll culture was embraced by British working class communities in the 1950's, owing to similar social developments as the US and the emergence of distinct youth leisure activities and sub-cultures. Today, the ex-mining generation has many Rock 'n' Roll fans and various tribute acts who perform in the Miner's Welfare social clubs. Eyes down at Byron Bingo, Hucknall, Nottinghamshire. Bingo is a popular game in ex industrial communities and sea-side resorts across Britain. Many former cinemas have been converted into Bingo Halls, such as this one at the northern terminus of Nottingham City's tramway. A coal train passing over Langwith viaduct, Derbyshire. Before the colliery closures, the railway lines were busy with trains delivering coal to major powerstations and to the docks for overseas transportation. 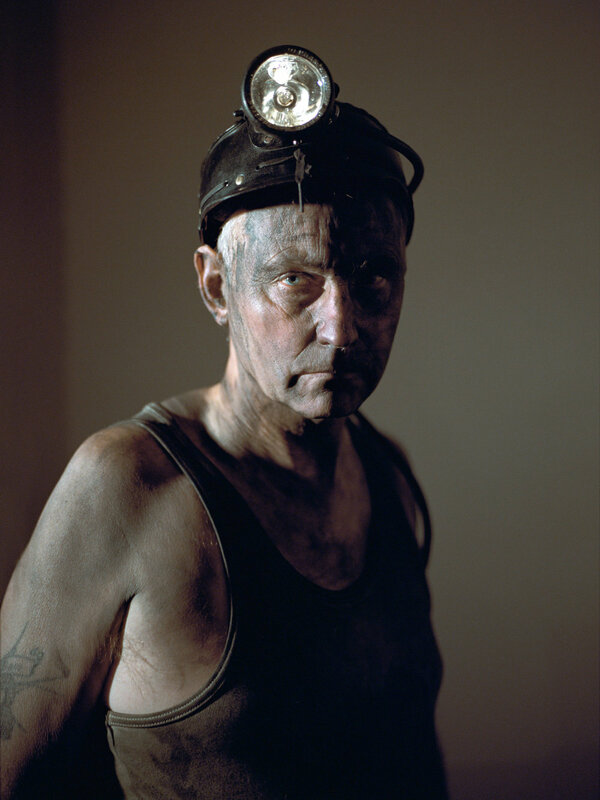 A mineworker among the coal stocks, Thoresby Colliery, Nottinghamshire. Thoresby Colliery, the last coal mine in Nottinghamshire closed in 2015, bringing to an end 900 years of mining in the county. Ashley taking a tea break, Thoresby Colliery, Nottinghamshire. Lamp room, Thoresby Colliery, Nottinghamshire. The lamp room at Thoresby Colliery, where miners' lamps are stored and charged. Andrew McKenzie, a foreman mechanic at the Thoresby Colliery, Nottinghamshire. Coal piled at one of the few remaining fuel distribution depots in the area, on the site of the former Mansfield Crown Farm Colliery. Former employees of the National Coal Board and British Coal and their widows receive a concessionary fuel allowance which is delivered to their home. Dogs and their owners playing in the snow, former Pleasley Colliery site. Many of the former colliery sites have been transformed from working industrial environments to leisure landscapes and nature reserves. My Father's lantern, from his mining days.